This tutorial explains how to track time spent on a program, browser tab in Windows. There is a free software called ActivityWatch that keeps watching your activities and records them regularly. The software is like a time tracking software, but with enhanced functionality. It shows how much time you actually spent on a program and even on a specific tab of your browser. You can see all the stats on the dashboard of the software. Also, it allows you to export the raw data as JSON file. ActivityWatch runs in the system tray of Windows. And it shows the activity dashboard in the default browser of your PC. Actually, the software creates a virtual server and keeps monitoring your activities. It records everything and makes a report that you can analyze later. 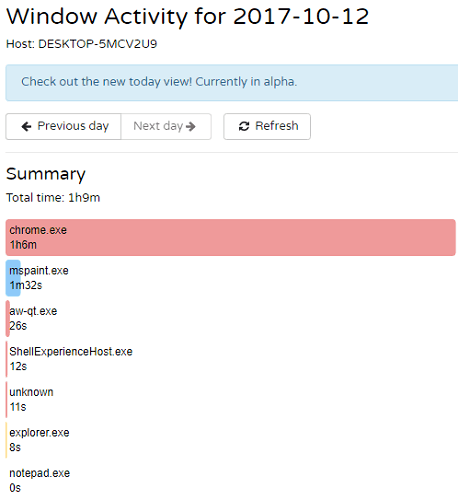 In the report, you can see the activity graph and other details like time, title of the window, title of the browser tab that you were browsing. How to Track Time Spent on a Program, Browser Tab in Windows? ActivityWatch makes it pretty easy to audit your activities. It also keeps the record of activities that you did earlier in previous days. You can easily navigate between the days to see your browser and application activities. In addition to that, the software also shows the mouse-keyboard activity stats. Here are few steps to track time spent on a program, browser tab in Windows. 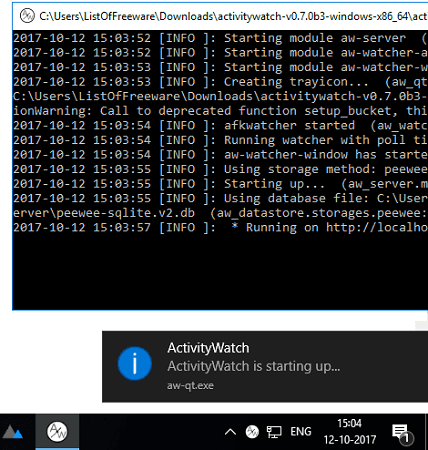 Step 1: Run the “aw-qt.exe” file and a command window will open up, starting the ActivityWatch server. After it has started, you can see its tray icon. And it automatically starts monitoring your PC. Step 2: Now you can start using the PC as you do normally. And the software will keep recording whatever you do. When you want to see the report of your activities, simply right-click on the tray icon of the software and then click on Open Dashboard. The software will open the browser and show you the report. 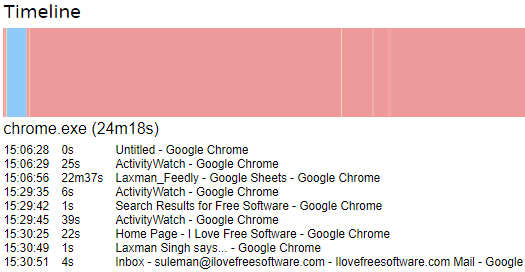 In the report, you can see the activity stats according to the applications you used and how much time you spent on it. Also, along with the report, you can see a combined timeline of activities. The timeline is divided into various parts and you can hover over them to see the activity stats. In this way, you can easily track time spent on a program, browser tab. And ActivtyWatch freeware lets you see that in a very descriptive manner. With the help of this software, you will always have the record of what activities are you doing daily and help you make necessary decisions to manage your time. 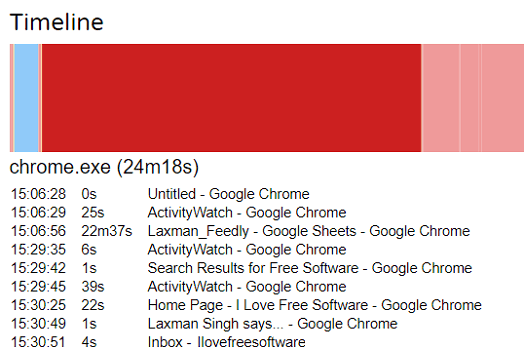 ActivityWatch is a very nice software to track time spent on a program, browser tab. I was looking for exactly the same software to keep an eye on my activities. And I am amazed by the features and functionality of the software as it is a very good tool to optimize my time by removing unnecessary activities from my schedule. Also, the software is still in development so you can hope for some new features in the coming updates.